Knowing better what happened in history can empower us to make better decisions for Hawaii and the world… Consider this article reposted from Civil Beat, written by hauMĀNA, an organization of young thinkers at the University of Hawaii at Manoa. Ah Kai to Hannah Kaikaina, Sept. 11. Pang See to Mary Freitas, Sept. 16. Joseph Kekoa Ross to Josephine Kekaha, Sept. 18. Roy Alexander Craw to Lily L. Williams, Sept. 19. Dan R. Vida to Ruth M. Vrellero [Viellero], Sept. 20. 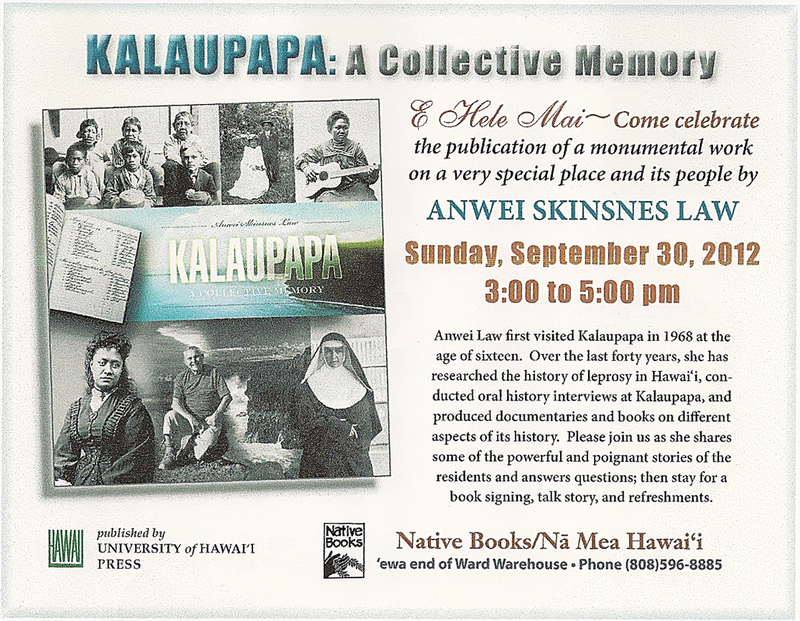 N. K. Hahola to Kahikina Lewis, Sept. 21. To J. B. Perkins and Jennie Mitchell, a son, Sept. 3. To Tmezo [Tamezo] Hasegawa and Abbie Rober, a son, Sept. 9. To W. Mead and Rose Bush, a daughter, Sept. 9. To Jacob Ai Ah Kwa and Angeline Jonah, a daughter, Sept. 14. To William Hoopai and Agnes K. Haili, a son, Sept. 15. 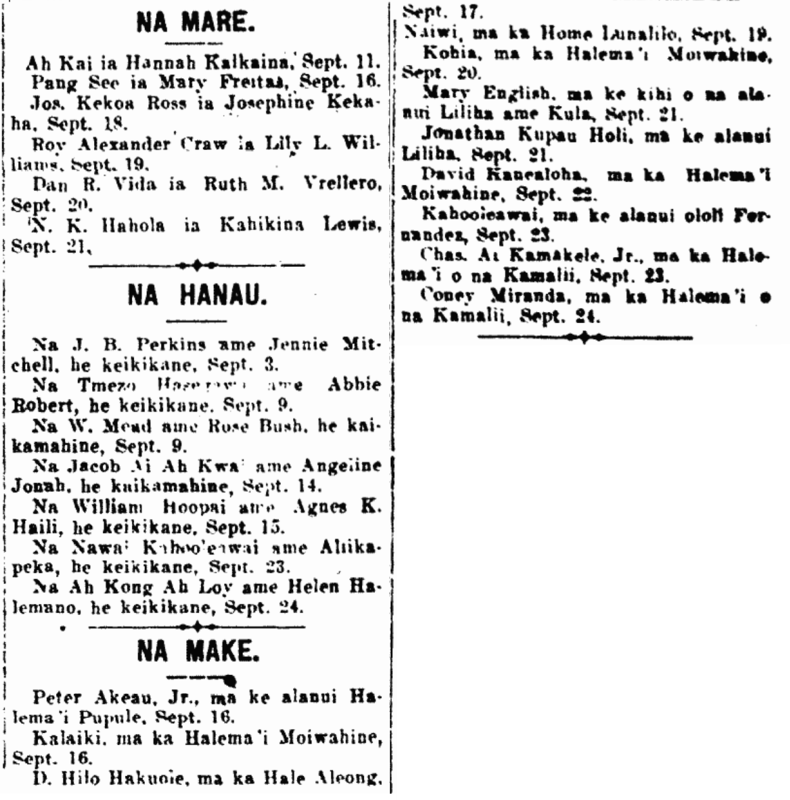 To Nawai Kahooleawai and Aliikapeka, a son, Sept. 23. To Ah Kong Ah Loy and Hele Halemano, a son, Sept. 24. Peter Akeau, Jr., on the road to the Insane Asylum, Sept. 16. Kalaiki, at Queen’s Hospital, Sept. 16. D. Hilo Hakuole, at Aleong House, Sept. 17. Naiwi, at Lunalilo Home, Sept. 19. Kohia, at Queen’s Hospital, Sept. 20. Mary English, on the corner of Liliha and School Streets, Sept. 21. Jonathan Kupau Holi, on Liliha Street, Sept. 21. David Kanealoha, at Queen’s Hospital, Sept. 22. Kahooleawai, on Fernandez Lane, Sept. 23. Charles Ai Kamakele, Jr., at the Children’s Hospital, Sept. 23. Coney Miranda, at the Children’s Hospital, Sept. 24. Ka Nupepa Kuokoa, Buke XLVIII, Helu 39, Aoao 8. Sepatemaba 27, 1912. Children rescued out at sea, 1924. Because of the quick arrival of help at the right time, three small children were saved, named Alfred Vieira, Jr., Jose Lima, and Alfred Silva, Jr., from death, when their canoe overturned outside of Kahala, on this past Friday, and they were in dire straits. According to the story of this near tragedy of the little children, they boarded a waa and travelled about Kahala; it was a day of rough seas and the waves were huge, and as they were approaching a crashing wave, their waa was covered over by the wave and went under. There was but one of the three children who knew how to swim, that being Alfred Vieira, Jr., and he was the one who helped his two friends in holding on to their waa until help arrived: James Reid and Theodore P. Melin, who returned the little children to land safely. Ka Nupepa Kuokoa, Buke LXIII, Helu 23, Aoao 5. Iune 5, 1924. 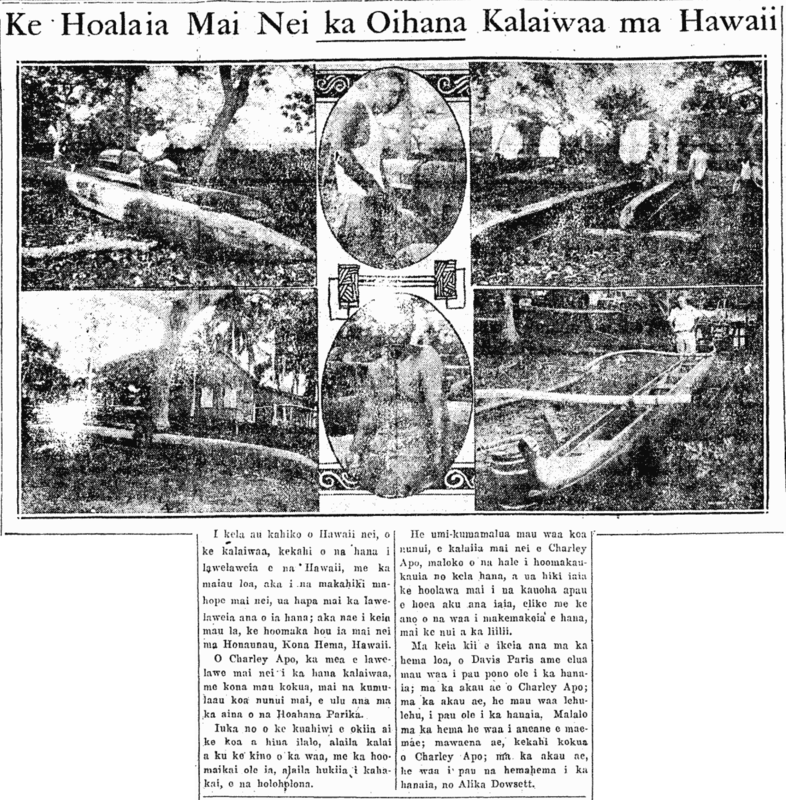 In the olden days of Hawaii nei, canoe building [kalaiwaa] was one of the occupations deftly done by Hawaiians, but during the years since, this work has gone down to but a fraction; but these days, it is being started up once again in Honaunau, South Kona, Hawaii. Charley Apo along with his assistants are undertaking this endeavor of carving waa from large koa trees growing on the land of Paris and Company [Hoahana Parika ?]. The koa is fell in the high mountains, then it is roughly carved out into the form of a waa, and then dragged to sea by animals. Twelve large waa are being carved by Charley Apo in a building prepared for this work, and he is able to fill all orders that he receives as per specifications wanted, from large to small. In the picture on the far left, Davis Paris can be seen with two waa that are unfinished; to the right is Charley Apo ; to the right of that are many unfinished waa. Below on the left is a nearly finished waa; in the middle is an assistant of Charley Apo; to the right of that is a roughly completed waa for Alika Dowsett. Ka Nupepa Kuokoa, Buke LXIII, Helu 23, Aoao 2. Iune 5, 1924. If everyone took care of their kuleana instead of looking for the easiest way out of it… 1899/2012. In times long ago, there lived in Kapalilua, South Kona, Hawaii, four old men; two of them were farmers and the other two were fishermen; the farmers would always supply the fishermen with their vegetable foods, and so too the fishermen would provide for the farmers, and so they shared for a long time. One day when the fishermen were returning and almost ready to land, they saw the farmers coming down to the plains with a basket of sweet potato; one fisherman said to the other, there are those farmers who gorge on fish. It would be good if we acted cunningly to those old farmers so that those old men don’t get our fish. So let’s hide the fish under the fish trap [ie] and place the leftover bait [poo maunu] on top, and when they approach the canoe, we’ll say, “O Farmers, we’ve got a problem, we’ve no fish, only the leftover bait;” the two fishermen decided to carry out this treacherous idea. When they got to the beach, there stood the elderly farmers. The fishermen said in a smooth [nalali ?] voice, “O Farmers, we’ve got a problem, there’s no fish on this canoe, we’ve just turned back for today, with just the leftover bait for this day;” the fishermen opened the cover of the trap [hinai] and said to the farmers, “this is the remaining bait, and so it that,” and so forth, and the farmers were left disappointed. It was a rule for fishermen not to give away the leftover bait to others; it was something that the fishermen ate. And so that day, the farmers went without fish and ate only some taro [kuala] without any fish, while the fishermen had their vegetable food and fish as they laughed; so it went the next day; the farmers were left without fish because of the actions of the fishermen. Then, the old farmers said, “That goes for us as well, we kept searching our patch, and there was no whole potatoes, just pieces. So you fishermen are in trouble, there are only pieces;” showing them, “Look, these are only pieces, those are pieces,” and so forth. So the fishermen went home and ate their fish without vegetable, and the farmers ate their vegetable without fish, but the farmers were satisfied. The place these fishermen were talking was outside of Olelomoana, and while these old fishermen were talking, the plot of the fishermen was heard by the farmers in the upland. At that, the farmers crawled that night from Olelomoana until Kolo, and that is why those places are called Olelomoana [Ocean Talking] and Kolo [Crawl], being that there was talking at Olelomoana and there was crawling to Kolo. Kapalilua was the only name before, but because of these old men, those places are named these names until this day, and the Honorable W. C. Achi is the owner of those amazing land sections [Ahupuaa]. And so it is said that the fishermen were troubled by the farmers because of the mischief they did to the other. Ka Lahui Hawaii, Buke 1, Helu 34, Aoao 2. Sepatemaba 16, 1899. Post Brown Bag: “The People of Kalaupapa as Active Participants in Their Own History.” 2012. Much appreciation goes out to all the good people at the Center for Biographical Research at UHM! And to Anwei Skinsnes Law and Henry Law for their presentation today!! I came out of it feeling upbeat, and excited that there are people out there looking at Hawaiian-Language source material for a window into the past (outside of the University). I encourage people to go check out the talk, questions and answers, and book signing put on by Native Books from 3 to 5 in the afternoon this Sunday. One year since the Republic transferred power to the United States, 1899. This is the Day that made a year since the day that the Hawaiian Flag was taken down and the American Flag was raised on the flag pole of Iolani Palace. The hurt down in our guts [naau] is unimaginable when remembering this; for there is no Hawaiian that can say that his naau is happy with what was done. Because if we are not mistaken, branded withing the hearts of Hawaiians is the love and pride for his Beloved Flag. The flag which holds memories of many years spreading its wings in peace over the cheeks of Hawaii nei. And for which none of us can say that we were robbed and saddened under its protection. Not at all! Our hearts will only cherish for all times, the loving memories and peace; and as such, are not each and every Kanaka Hawaii burning with aloha for it? Therefore, where is it today? It has gone, and died; and it is but the wisps that are budding, without a parent to feed its nourishing waters. For the trunk has been chopped. 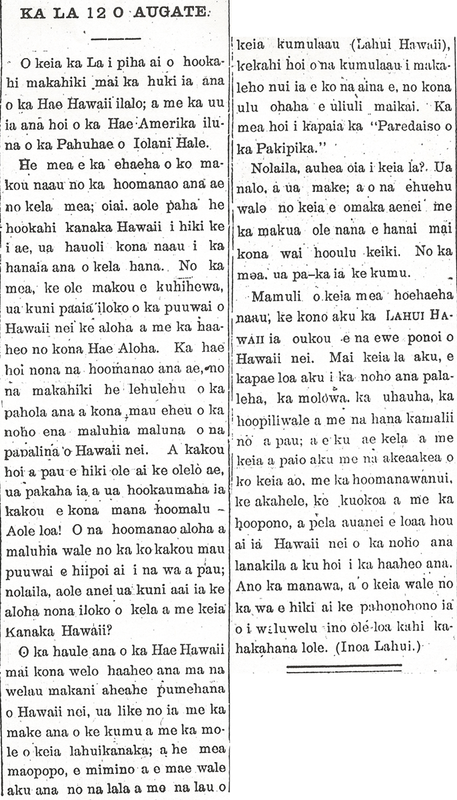 Ka Lahui Hawaii, Buke 1, Helu 29, Aoao 4. Augate 12, 1899.